When is Part IV arriving? I have been collecting as much imagery and information as I can, but have begun having doubts about the inclusion of several of the tornadoes at the end of the list. Before I finalize part IV, I need to make sure I agree with my own categorization. I have received several e-mails regarding certain tornadoes that fit the criteria specified that were not included, so I’m trying to make sure my “indefinitive” list is as accurate as possible. I’m curious. I noticed that you included virtually all of the EF5s of the last 4 years. Are each and every one of them among the most intense or is it that there’s a lot of conclusive info thanks to modern tools to analyze in depth. The list is definitely skewed towards more recent events. I tried to be as objective as possible by comparing damage photographs, and the amount of imagery from the 70’s, 80’s and 90’s is often limited. With that said, the 2011 tornado season was definitely the most impressive in modern history – the Smithville, Philadelphia, Phil Campbell, Joplin and El Reno storms certainly deserve a high ranking on any list of tornado damage severity. The more information I acquire, the more accurate the list will become. As I have always said, I love nothing more than when readers send me information/damage photographs that I may have missed. 1. The 1990 Goessals tornado is rumored (by chasers) to be one of the most intense. 3. The 1953 Flint seems scary but I don’t know of the intensity. It simultaneously picked up houses on Coldwater road before exploding them. 5. The 1947 Woodward seems to be a monster but it happened so long ago. 1. 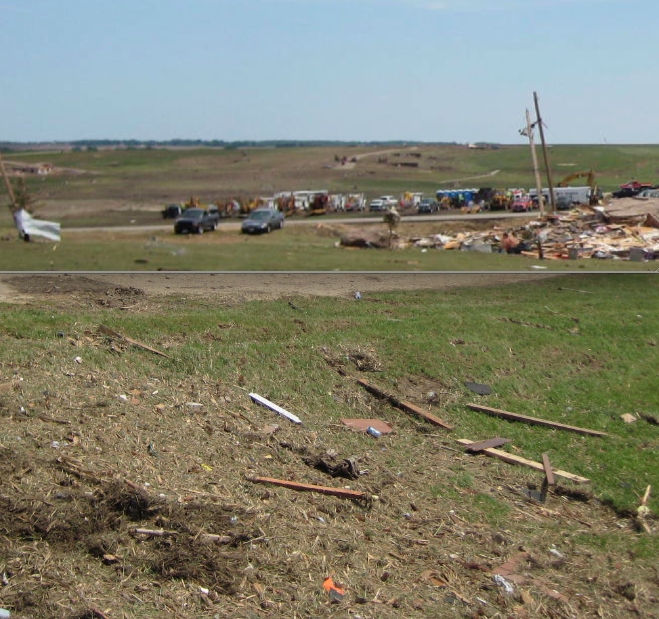 Two news articles discuss the Goessel tornado’s “incredible intensity”, and one even says that Prof Fujita reviewed the damage path and estimated winds of 300mph or more due to the position of spiral ground markings. Other than that, there is no information or damage photographs available of the storm. I have even contacted the Goessel Public Library and they had nothing. So as of yet, there is not enough information to categorize it. But video of the storm shows some pretty impressive rotational velocity right after the storm merged with the Hesston tornado. 2. The Jordan storm caused no deaths, so it was not considered. Several reports mention that Prof Fujita considered it “the strongest” he had ever surveyed, but I have never found any text by Fujita himself confirming he felt that way. Also, 1976 was fairly early in his career. 3. The 1953 tornado in Bleecher was extremely intense and narrow. It would surely deserve a place on a list of damage severity, but it occurred before 1970. 4. Lots of discussion about the Guin tornado on another post. In short, despite all the incredible claims about the storm, there are almost no damage photographs (and the one’s that exist are not overly impressive), and there are no reliable first hand reports of the destruction. Therefore, not enough information for it to be included. 5. 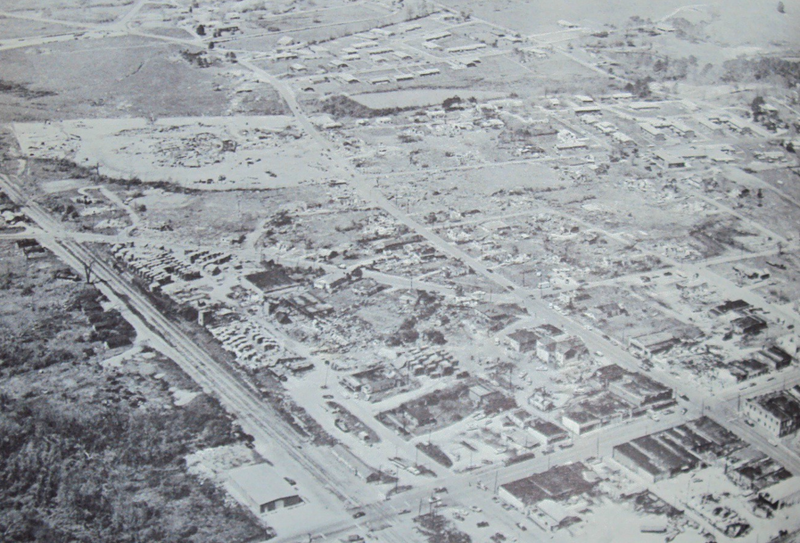 The Woodward tornado was a monster, but pre-1970. I have not spent enough time researching it to form an opinion on it, but in time I will. 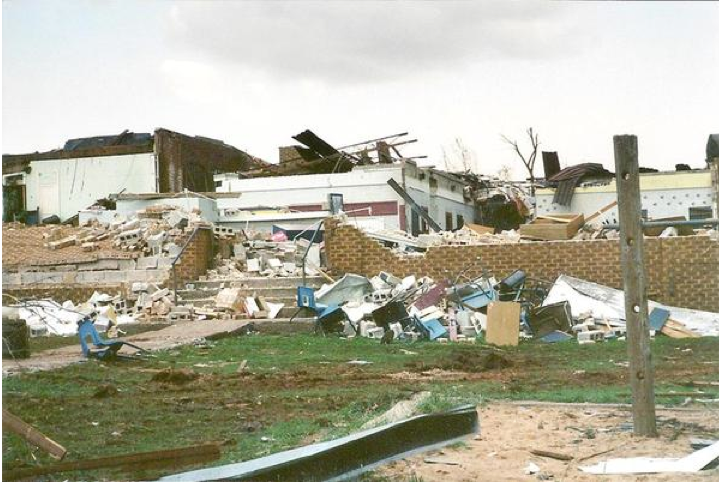 I know it didn’t cause any fatalities, but since the 1995 Kellerville tornado got a mention, I feel that the 1995 Pampa, Texas tornado should have had one as well, because in terms of violent rotation, debris velocity, sheer strength and violence, nothing beats that one. 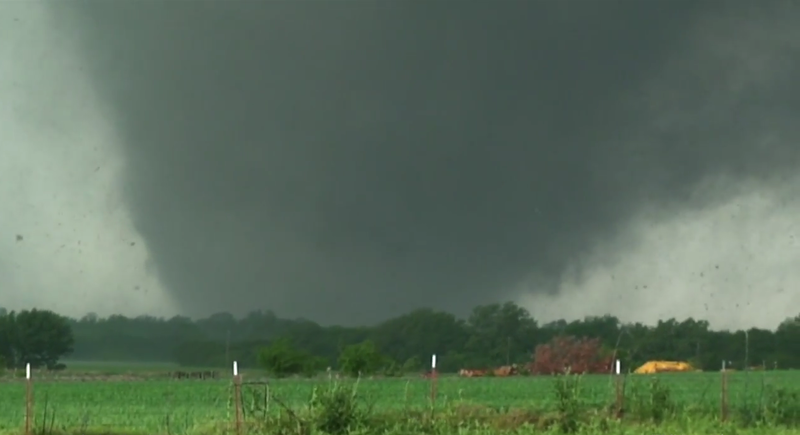 Out of all the tornado videos I have watched, Pampa is absolutely incomparable. I only wish it was easy to find damage photos and surveys of the event. I have been unable to find damage pictures online, but I own a VHS tape that shows storm chasers driving through the damage path immediately after the Pampa tornado. 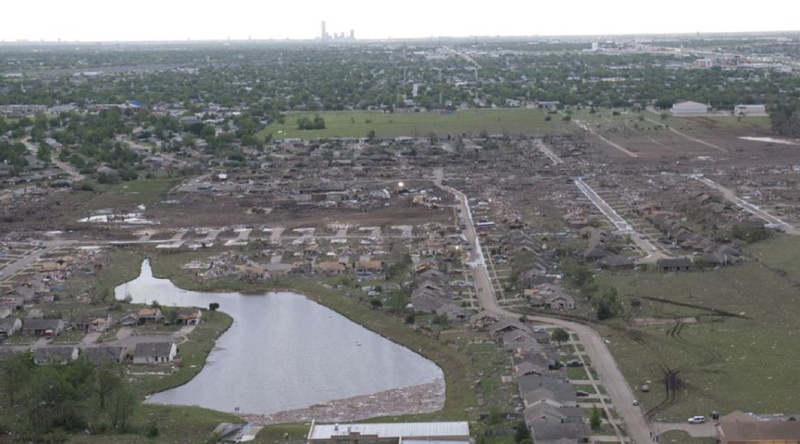 The damage is intense – all of the shredded buildings were caked in mud – but I don’t think the Pampa tornado, or the Elie tornado, were more powerful than the Smithville or Kellerville tornadoes. The Pampa and Elie tornadoes both moved very slowly yet didn’t cause any serious ground scouring, while the Smithville tornado had a similar sized core that clipped along at 70mph and caused MUCH more intense vegetation scouring. The difference is that the intense core of the Pampa tornado was clearly visible, whereas the most intense vortices in wedge tornadoes are hidden by debris. Had the Smithville tornado been more transparent, I imagine that the speed of the winds in the center of the tornado would have been like nothing ever filmed before – cars were likely lofted 500ft+ into the air and thrown more than half a mile in one toss. What is the name of the VHS? I believe it was “Twisters: Nature’s Deadly Force” but I am not sure as I no longer have a VHS player so I can’t watch it to confirm. Maybe it’s just me, but the Hackleburg tornado’s path closely paralleled Guin’s at some points, and it seems to have narrowly clipped the northwest edge of the William B. Bankhead National Forest. I wonder why there’s never been more category 5s in Arkansas. You would think that since it’s east of Oklahoma that there would be more. I believe its because the state sits perfectly in between the two zones where violent tornadoes are most frequent – central tornado alley and northern Alabama and Mississippi. But I’m sure multiple tornadoes capable of causing EF5 damage have swept through the state. It has a fairly low population density and wide expanses of forest so NWS personnel often cannot do thorough damage surveys. All of the tornadoes in this Part III were incredible. The damage pictures from the Guin tornado actually look the least convincing to me despite all of the fuss about how it was “an F6!” Is there a reason you ended up adding the Guin tornado? I see in another post someone said you initially did not include it. Do you think the Joplin tornado compares well to any of the other tornadoes on the list? As in, if it has occurred in a rural area, would it have still been notable enough to draw attention from the weather service? I’d love to hear anyone’s thoughts on this who reads this comment. I guess I did include the Guin tornado due to Mr. Elliot’s statements, and the fact that Grazulis said it was “one of the most powerful” in Alabama history. 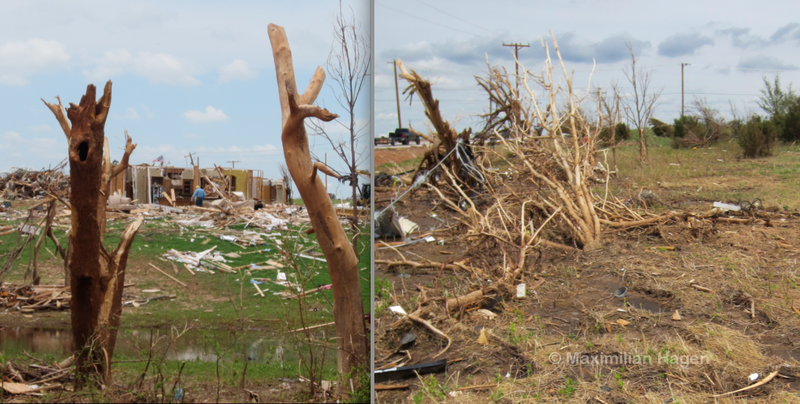 I have yet to see a damage photograph from the Guin storm that definitively shows EF5 damage. As for Joplin, I think the tornado was typical of large, violent storm’s that develop annually in the Great Plains. A good comparison in terms of size, speed and strength might be the 1999 Mulhall tornado, though the Joplin tornadoes width of EF3+ damage (0.6 miles) was not as wide as the Mulhall storm (probably a bit more than 1 mile). Jesus why does this keep happening in Moore?? It’s incredible how frequently Moore and the northwest suburbs of Birmingham, AL, get struck by violent tornadoes. 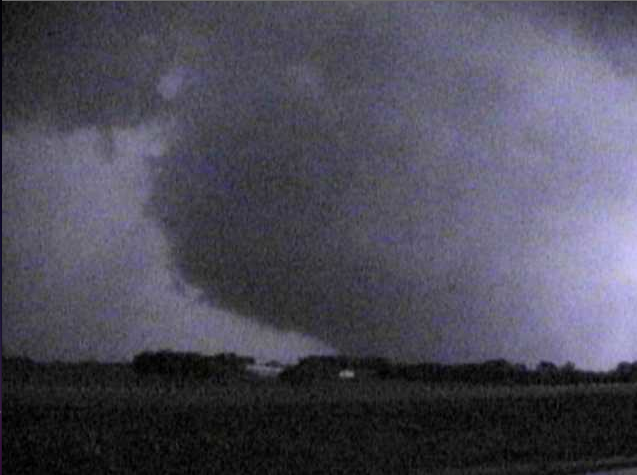 This tornado was like many that touch down in the area – it just happened to cross a populated area. I imagine the death toll will reach somewhere between 45 and 70 when all is said and done – significantly worse than the ’99 storm. I also imagine it will be upgraded to an EF5 in the next two days. The storm struck fewer homes than the ’99 storm, but may have been more intense and also was not as clearly visible. The ’99 storm also spent more than 45 minutes grinding through areas to the southwest, whereas this one entered Moore less than 20mins after touchdown. I am working on a project over tornadoes that occurred in the 1990’s and I had four questions. 1. Do you know where I could get information on the Kellerville tornado? 2. Would you consider the Muhall tornado an F4, or F5? 3. Do you know where I could get information on the Red Rock tornado? 4. Would you consider the Pampa tornado an F4, or F5? 1. The link in the entry above is the best I know of in regards to the Kellerville tornado. 2. I’d say it was very likely capable of causing F5 damage. 3. Not sure at the moment, but just do a search in google scholar. 4. Was very likely capable of causing F5 damage. The second tornado to be rated an EF5 the Parkersburg/New Hartford tornado was definitely more impressive than the Greensburg tornado as far as the damage go. The Parkersburg/New Hartford tornado left humongous spiral marks on the ground. 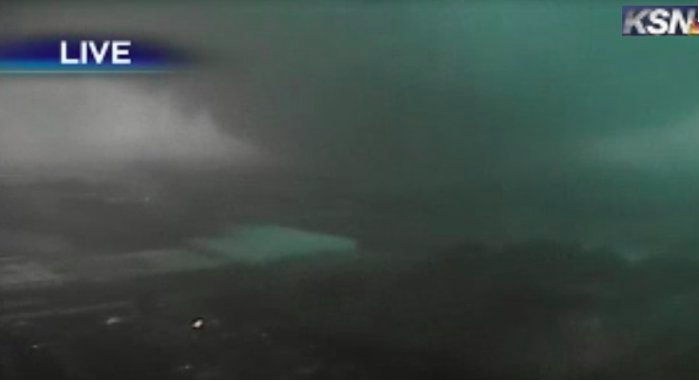 I didn’t see anything like this with the Greensburg tornado. Try to argue to those who chased the Greensburg tornado and surveyed the damage that the Parkersburg/New Hartford tornado was stronger than the Greensburg tornado. You will get shunned. 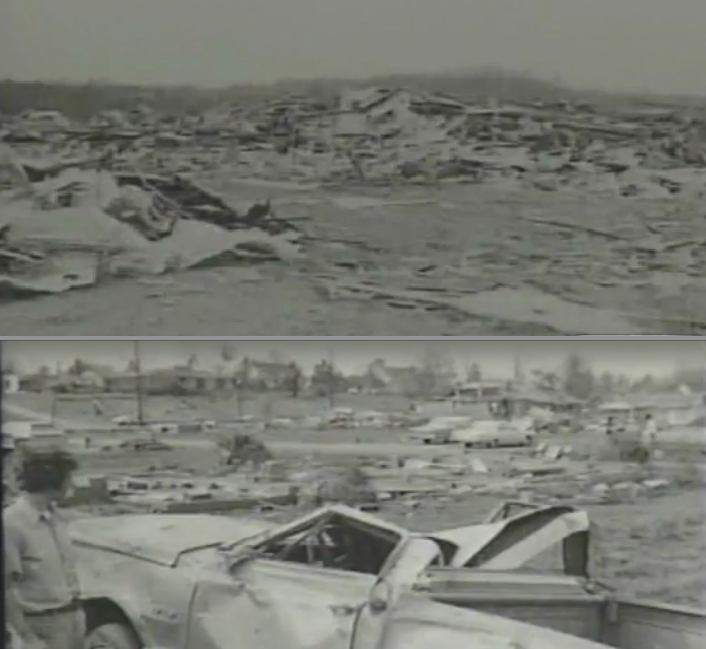 The Joplin tornado was truly a monster. It seemed to have consistent EF-5 damage & intensity for most of it’s life cycle based on the massive uniform devastation and the videos. It seemed to go to EF-5 strength almost immediately upon formation. In this video you can see it literally explode I have never seen a tornado go that violent & intense that quickly. The motion is amazing. Probably surface winds around 250mph+ at its peak if not higher. If a tornado pulls deep rooted shrubs out of the ground is that an indication of a violent tornado(EF4+). I know in Parkersburg, Iowa there was a house that received EF5 damage and right across the street there were shrubs that were pulled out of the ground. I also know the Westminster, Texas tornado also pulled shrubs completely out of the ground. Depends on plenty of factors, including debris impacts and the size/strength of the plant, but I’d say the removal or near removal of small, well-rooted shrubs is a sign of high intensity – particularly if the bush is stripped bare. Regarding Guin, I’m still digging up info. I had become pretty skeptical about the supposed intensity of the Guin event, but what I dug up recently made me reconsider. First of all, I never seemed to notice that in “Significant Tornadoes”, Grazulis mentions that an entire block was swept clean of all debris. Sounds rather impressive imo. While not really a reliable source, this next one is pretty interesting. the the 11th comment in this article is an eyewitness account of the Guin damage. The second newspaper link and the Myra Week comment were very interesting. 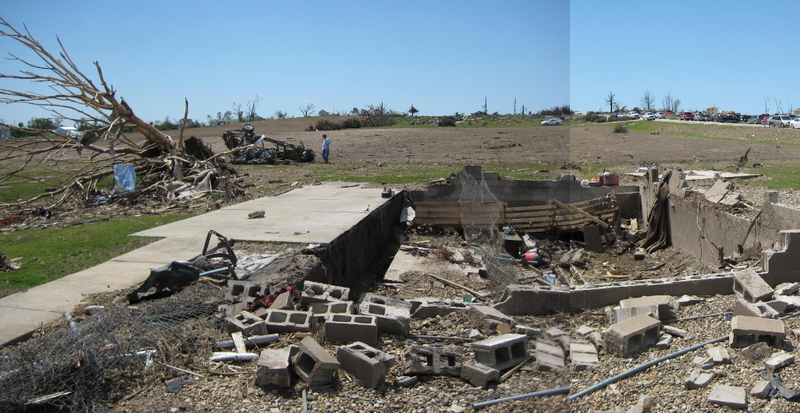 If the Guin tornado did, in fact, uproot foundations and dig/scour the ground clean then it would deserve a place at the top of any tornado intensity list. a) All of the comments regarding foundations being ripped from the ground commenced 20+ years after the tornado, from what I have seen. As with some other famous weather events (Xenia tornado, Hurricane Camille etc…), time leads to some serious distortions. c) The Grazulis reference to “everything” being carried away from a city lot in two seconds is strange. How on earth could such a claim be verified? d) Fujita surveyed all of the ’74 paths and never made any special mention of the Guin tornado in his many published articles, from what I’ve seen. e) The proportion of fatalities vs injuries/fatalities vs homes destroyed is less than the Brandenburg tornado and other events on the same day (despite striking after dark). 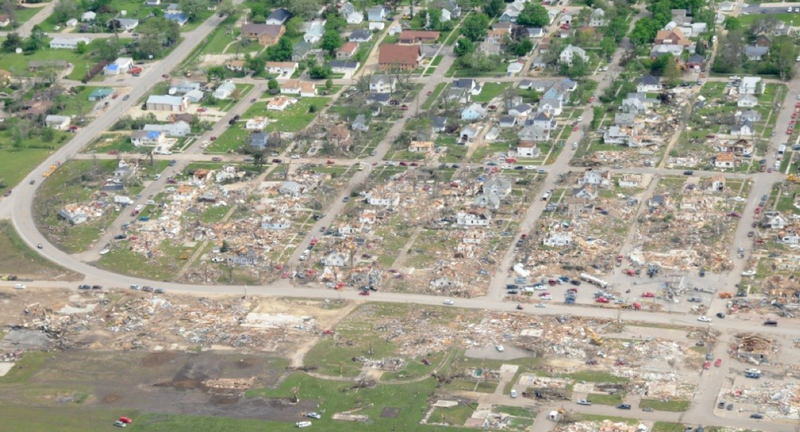 f) The Phil Campbell tornado was just as fast moving and violent, it would seem, and destroyed far more homes at peak intensity yet didn’t dislodge a single foundation – nor has any other documented tornado. Yeah there just isn’t enough reliable info out there to verify many of claims about this tornado. The only damage pics I can find are very grainy and hard to examine. However, judging by the the what information is available, I would still say that Guin was still likely a very violent tornado. How come no recorded tornado has ever dislodged a single foundation? You would think that since they can scour pavement, the same would happen with foundations too. 2. )Foundations are usually set about a foot or more into the ground, so the wind is going to have a very hard time getting “under” the slab. Asphalt simply rests on the surface. There IS one probable instance of this occurring in Smithville, but the skimpy and vague NWS survey writeup leaves out many details, so it isn’t mentioned. Very interesting thanks! Is it possible in very rare extreme cases for a foundation to be dislodged and completely swept away? To answer your question, it technically is possible, but it has yet to be officially documented, and would require a tornado of almost inconceivable intensity imo. With that said, the Smithville tornado likely did dislodge and tear up the slab at the Cox residence, so who knows what would have happened if the tornado was slower moving. I believe the images I provided of the Cox home are being over-analyzed. While I am a firm believer in using photographs as evidence regarding intensity, the photograph does not clearly indicate anything to me. The manner in which the foundation appears partially lifted is suspect – that might be the whole foundation (which would be bizarre since the winds only uprooted a section of it without blowing it away), it might be flooring, it might be something else entirely. A chimney may have ripped out a section of the foundation, but I have not found any clearer photographs to verify this. As for dislodging foundations, buckeye expressed my sentiments. It is possible (ala Philadelphia style ground scouring) but surely a rare occurrence. 1.) A wooden foundation would not fail in the manner we see here, and we would be able to see where the individual wooden floor boards were ripped up. I see no wood anywhere on this foundation. 2.) I have never seen flooring that thick. 3. )The aerial pic shows the true thickness of the slab. In the missing section, you can see a shadow cast by the jagged edge of the remaining slab. Bare soil is visible where the concrete was previously. 4. )Angular, ragged pieces of torn up concrete are clearly visible in the aerial picture. 5) The area of uplift is visible on the aerial shot as well. 6). What convinced me the most, is that the way the edge of the foundation failed is consistent with rebar enforced concrete. Most slabs have a latticework of rebar running horizontally through the foundation. Even if part of the concrete were to buckle, it would still remain attached to the rest of the slab, unless it was ripped away with enough force to snap the rebar. Deformation, rather than total separation from the rest slab would occur. On the ground level picture, you can even seen what looks to be a bent piece of rebar sticking out of the side. I simply can’t think of anything that these pictures show other than what it appears to be. I don’t know of any foundation type other than concrete that would fail in this manner. I just looked more closely at the original image that was sent to me, which is rather large, and it does appear to be a foundation. Thing is, the foundation was dislodged on the northeast side, the opposite side of where the most intense winds would have occurred in such a fast moving tornado. Second, the manner in which it is dislodged near the edge may be the result of a clean-up crew/bulldozer immediately after the tornado. 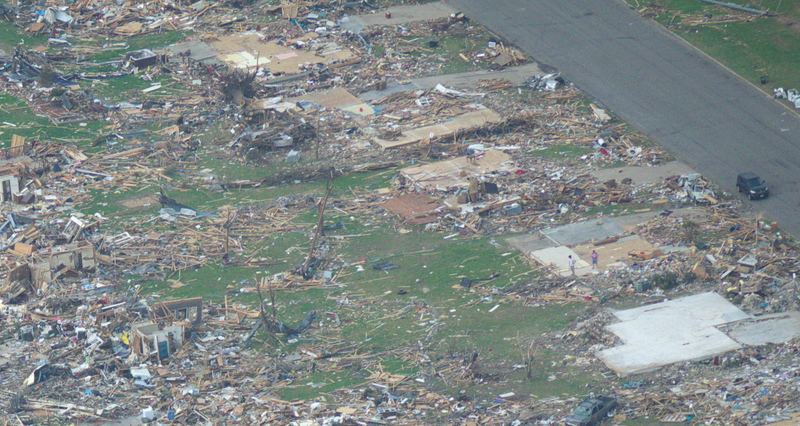 The photo I have was taken approximately 3 days after the tornado. 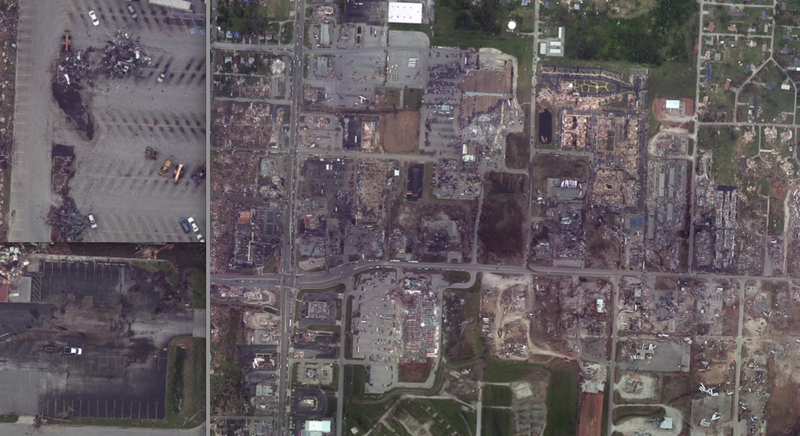 The satellite images I utilized of the damage were taken May 2nd, five days after the tornado. I believe the Smithville tornado was exceptionally violent and I want to find all the examples I can of its power. I just wouldn’t say the photographs of the foundation pass the litmus test of what can be considered verifiable. Same with the culvert on Market Street – photographs make it clear the tornado ripped it out, but the local police say they bulldozed it the day after the storm. Just wondering, what do you think of the 1944 Shinston, WV tornado? Early on when the internet was new I was left with the impression that it was an F5 I guess it was misinformation. I have a gut feeling it was just an F4 or 3 you don’t hear much about it. Honestly I don’t know much about that tornado. I’ve seen some damage pictures and saw nothing that looked clearly above F3 intensity. I’d love to see more information at some point as I’m most interested in unusual tornadoes that strike unexpected places. And on this page is a PDF of “April 3, 1974: A Night to Remember” by Charles Jordan that contains several photos (ground & aerial) of Guin and other tornadoes of that day. http://www.srh.noaa.gov/hun/?n=interviews_videos_04031974#reports. Do you think the surface winds in the 2008 Parkersburg/New Hartford tornado could have approched or exceeded 300 mph? In particular, the damage done to the swept away home’s knocked over basement outer wall and cracked floor? Do you think suction vortices were responsible for this type of damage? I have a quick question for you, if you don’t mind, what is a “maxi tornado” Or “maxi wedge”? 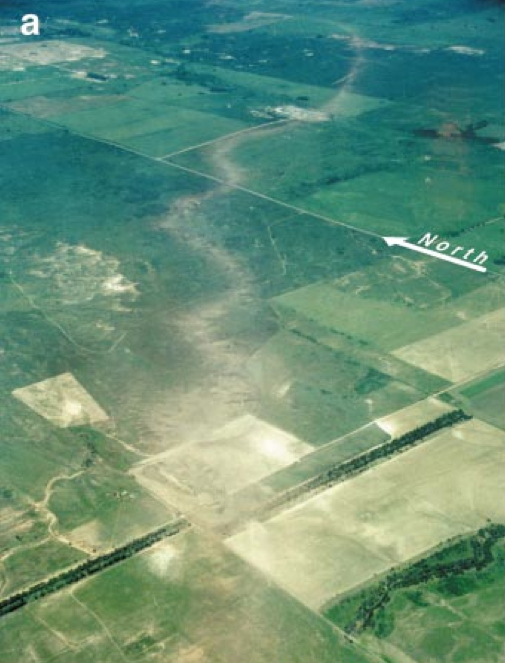 The term “maxi tornado” was used by some researchers following the May 31, 1985, outbreak to describe the F5 tornado that devastated Niles and Wheatland. I think it’s just a way of referring to a tornado at the top of the Fujita scale. I will have to respectfully disagree with you there. I surveyed the damage from both the ’13 Moore and ’13 El Reno tornadoes (I have a posting with my photography for each storm), and I felt the damage from the Moore tornado was significantly more intense in every way (more intense ground scouring / tree damage / structural damage). And while I was very impressed by both tornadoes, I wouldn’t put either of them in my top 10. Given the photos and descriptions of the Parkersburg-New Harford damage from 2008, I’m surprised you didn’t rank it higher. 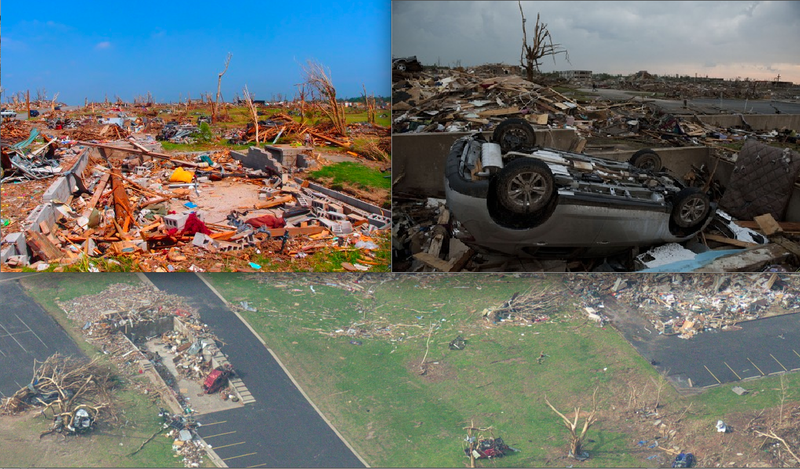 The debris granulation and total sweeping away of homes (and consequent killing of victims sheltered even in recommended places) suggest at least a top 10 violent tornado, not top 5 only because of the four on 4/27/11 plus Jarrell. I also find it mind-boggling that the Joplin tornado is highlighted as “disputed” on the Wikipedia F5/EF5 list because of that ASCE study. A tornado simply doesn’t kill >150 people in this day and age without being exceptionally violent. For example, Tuscaloosa-Birmingham of 4/27 was clearly at minimum a very high-end EF4, probably hit about the same number of homes as Joplin, yet caused less than half the number of fatalities (and we thought THAT was as bad as it got). That and there were abundant contextual DIs (such as the concrete parking stops and hurling/mangling of vehicles) consistent with other high-end violent tornadoes. Theresa lot of debate about tornado ratings when it comes to these F5’s. Problem is theres a lot more going on..not just the amount of debris picked up, its the type of debris, forward ground speed, what side of the funnel vs geography of the landscape.. suction vortex vs main funnel etc. The type of debris is like a different grit sandpaper.. if there is a lot of dense airborne items such as car parts and concrete bits its going to do a hell of a lot more damage to structures vs if its just full of dirt and grass. The suction vortex spin ups can be very violent and erratic, so rating them is very much based on place and time rather than the actual intensity. Technology is getting far enough along we should be getting closer to accurate wind speeds based on factors other than damage. Another thought is with the quality of video these days you can get estimates of rotational speed just by visual..estimate width and time for an item to get from one side to the other etc. Rate the Damage whatever but to me it would be interesting to see the overall power of the wind from one storm to another.